The announcement has been made public that among the city of Dallas’ next bicycle infrastructure projects is coming to the Sylvan/Tyler-Polk corridor from I-30 to Davis. 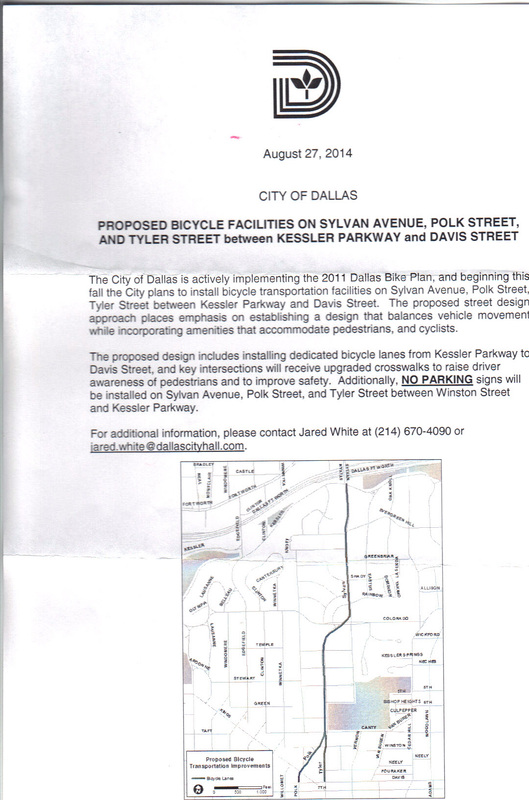 We were told at the Dallas Bicycle Coalition meeting yesterday evening that it should kick off within the next month or so. We appreciate the leadership of Scott Griggs who has helped bring more bicycling infrastructure to our neighborhood, our local bike shops, Oak Cliff Bicycle Company and Dallas Bike Works who sell and support city bicycling, and developers like Dave Spence for having the foresight to bring in more bicycle related businesses and encourage bicycling to his tenants businesses! If you’d like to voice your appreciation about this new project, please email Scott Griggs at scott.griggs@dallascityhall.com or Jared White at jared.white@dallascityhall.com. I went to the meeting over on Fort Avenue on this. The fact is, there isn’t enough room on Sylvan for a buffered bike line. You could make something that looked like a lane but it would really just be some “city tiddys” and a gutter. To have two lanes and a buffered bike lane would require tearing up beautiful yards and cutting down trees….and nobody wants that, especially when there are at least 3 alternate routes to Sylvan immediately available. If we don’t want parks dug up for freeways, we can’t ask for 50 year old yards and trees to be dug up for bike lanes. Bill, the outside lane would have been the buffered bike lane. No curbs would have been moved nor trees uprooted. Simply put the new stripping there would have been stripped for bike lanes instead. ← New Uplawn-Oaktown Route! … err, I mean, Uptown-Oak Lawn!